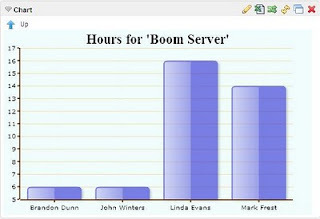 NextReports Server is able to show drill down charts inside dashboards. The number of levels to drill down is infinite. If a chart has at least one drill down chart , the chart icon will show this through a "link" bullet. 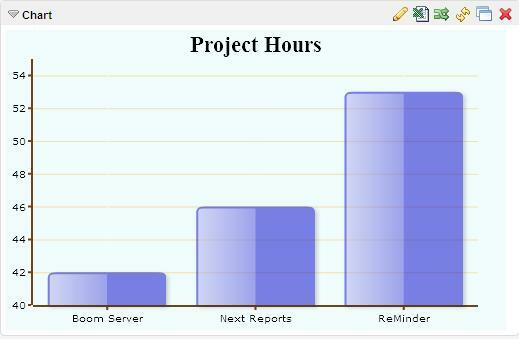 For our example we have a chart which shows the projects (x axis) and number of hours for every project (y axis). First drill down chart will show the number of hours worked by each employee. 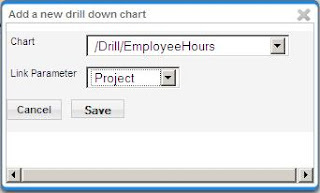 To create this first drill we add the chart with a "project" link parameter which contains the project name x axis value. Second drill down chart will show the number of hours for each workcode for selected project and employee. To create it we add a chart with an "employee" link parameter which contains the employee name x axis value. For every drill down level all selected parent parameters will be passed. In our example, for second drill down chart, the project name will be also passed along with employee parameter. 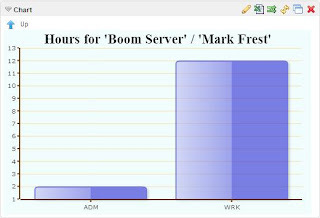 From here we can also delete drill down charts. When we add the ProjectHoursBar chart to a dashboard, we won't see any difference to a simple chart. You can view this on the online demo.